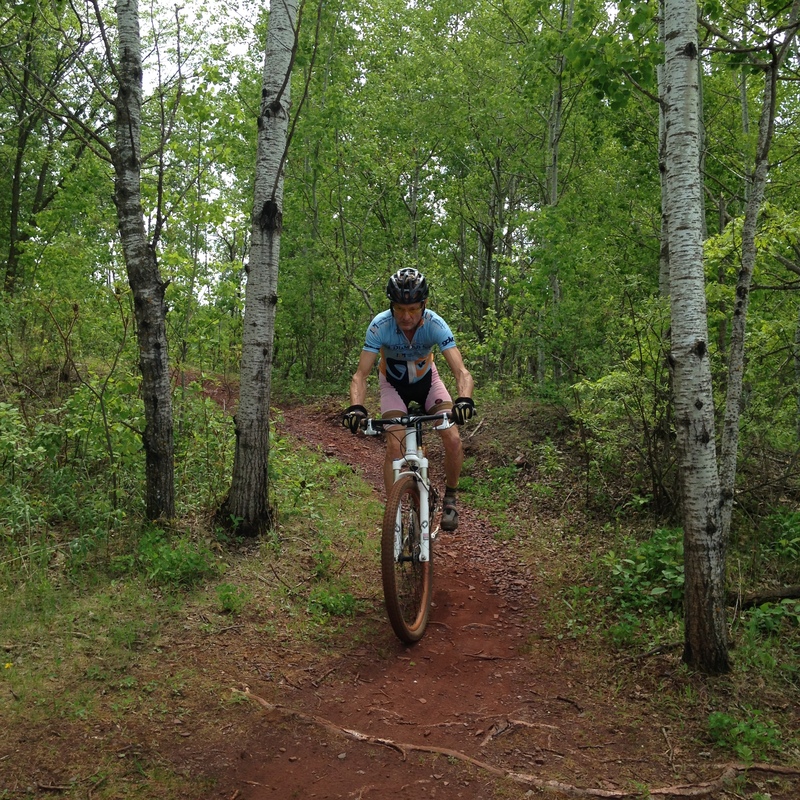 We’ve been hearing the siren call of red dirt trails at Cayuna Mountain Bike trails in Crosby, Mn (near Brainerd) for several weeks now, and finally the weather and our plans cooperated. Gerry has been out for trip #2, putting in a total of 300 miles and averaging 22.1 miles per gallon pulling once again with the 2011 Prius. Coincidently, Gerry was on the road as we remembered the trailer’s namesake, Gerry Benedum, with love and fond memories on her birthday. The trip was easy – a slight head-to cross-wind of about 10 mph, good roads and not too much traffic. 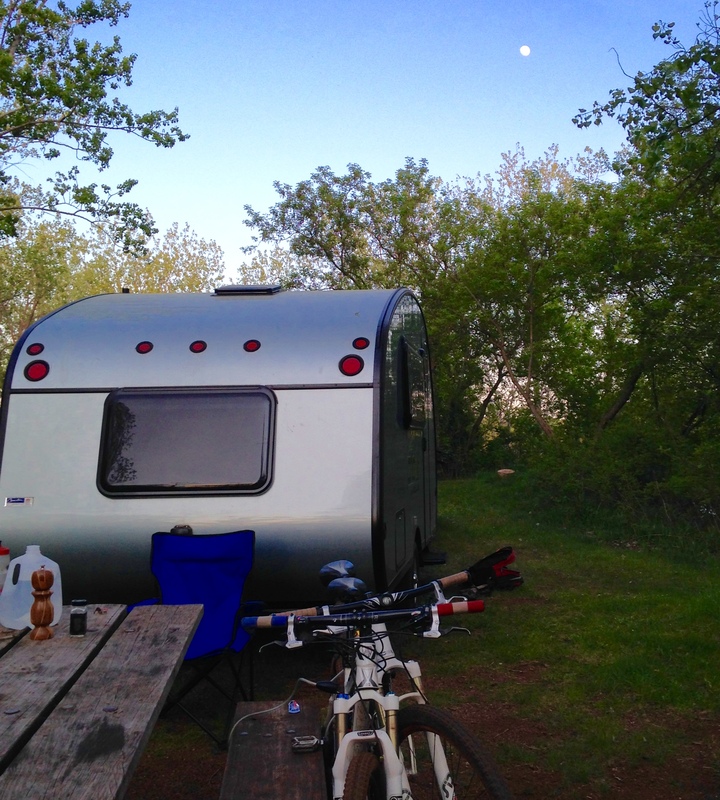 The campsites at Portsmouth Campground, run by the Minnesota State Park system, has decent flush toilets and a hot shower, so we paid for a bare tent site, and did not hook up to water or electricity. We were a bit shocked to find that Minnesota has done away with all walk in campsites and that you must call in to reserve a site before you set up. No more looking around for a site you like and self-registering. Mimi’s phone was ‘frozen’ on no service and we ended up driving back to town to search for phone service or a phone to use. We found the Minnesota DNR office, but they could not register our campsite for us. The very nice ranger sold us our park sticker and said we should have phone service. A re-start of the phone proved him right. Lesson learned: the phone does not always pick up service after losing it. A frustrating phone call ensued, after a hold period of a few minutes, in which the reservation phone agent’s had to take all the information twice due to computer problems. Just let us self-register please!!! 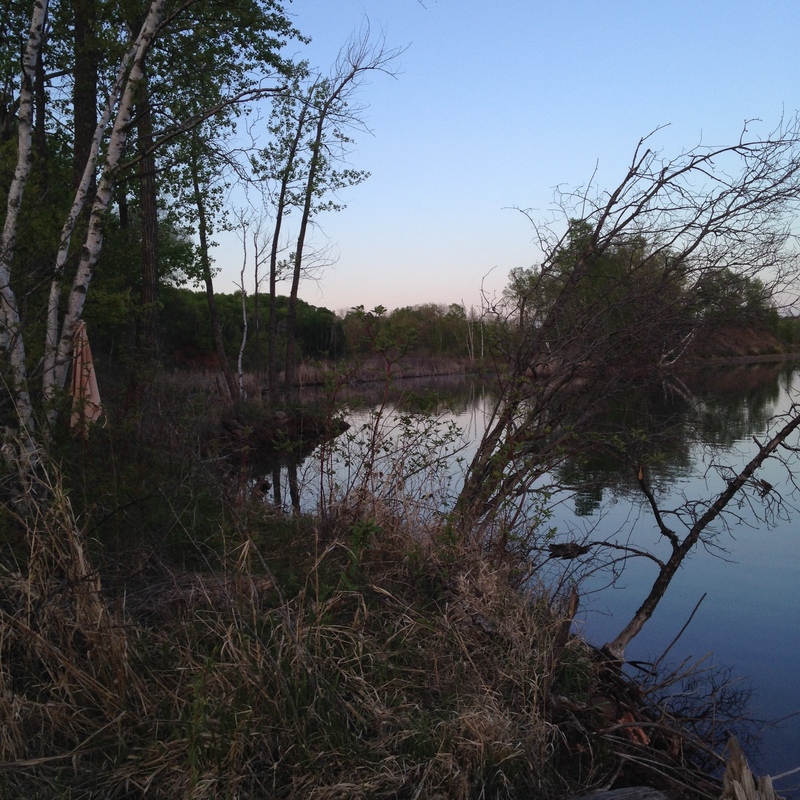 Dinner went well, a beautiful evening in the north woods. We vented the trailer and had windows open and had no need for heat, although we planned to used the gas heat in the morning to warm things up for breakfast. After 12 miles on the trails, a salmon and rice dinner, and a cozy evening, we closed up the trailer and settled in for a snug sleep. Until…….WTF!! Loud alarm. Red- flashing light!! Panicked leap from bed! The CO detector under the table was going off. We re-set it, only to repeat above scenerio an hour later. We opened the vent and the alarm did not go off again. We researched this upon our return and found that many other Alto owners are having the same problem, to the point of disconnecting the alarm. One owner reported being on their third alarm, and the issue is still not resolved. This is a safety concern and we are not sure yet how we will deal with this. But, ahhhhhh! The riding is epic. Bob did about 55 miles, and Mimi, about 43. 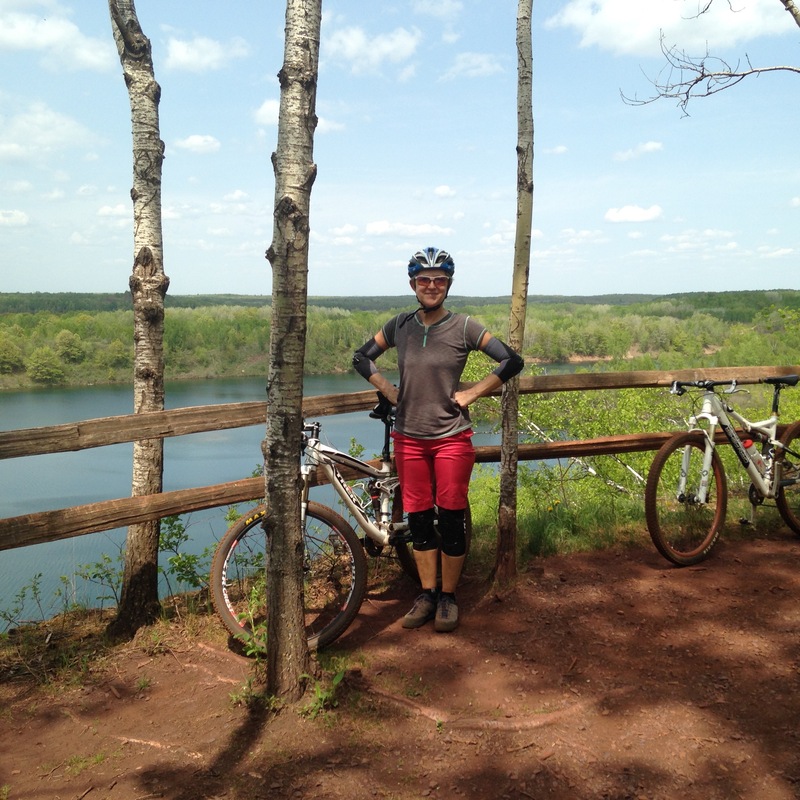 The trails are built in an area of beautiful clear trout lakes and hills, a short 80 or so years ago once the raw scars left by abandoned iron-ore mines, but now a showcase of nature’s miraculous healing and recovery. We did most of the trails at least twice over the 2 1/2 days, and returned to our favorite trails yet again. Bob-sled gets the sheer thrill award, but all of the trails are expertly done and amazing to ride. The tag-line of the trails is “Shred the Red,” and the dirt really is red here. Our bike tires, shoes and lower legs were all indeed ‘red’ when we finished our rides. Tired and tinted red, we headed out Friday ahead of the weekend crowds (one of the luxuries of being retired) for the trip home. We anticipate getting back to these trails soon!